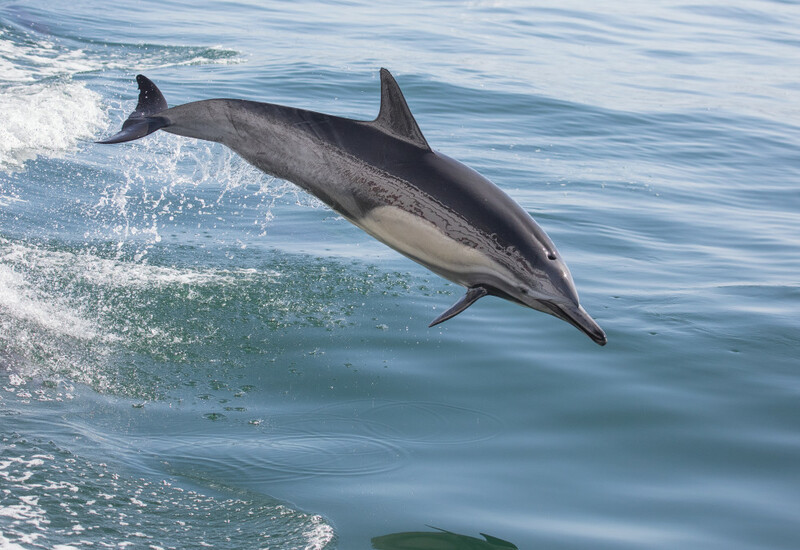 Having reached the apex of its leap, this dolphin prepare to slip back into the Pacific. As so often happens when you take a "whale watching" trip in Orange County, CA, you end up seeing a lot more dolphins than whales. As it happened today, we actually did see two gray whales but they were downright boring — just barely peeking above the surface, with not so much as a wave of their flukes — compared with the active, playful pod of common dolphins that sped along beside our boat. I've found a technique for shooting these slippery (literally and figuratively) guys: you have to find one swimming and wait, with your finger on the shutter, for him to jump. And then you shoot the heck out of him. If you wait for a dolphin to jump before you point your camera, the only shot you'll get is his/her tail disappearing into the Pacific with a splash. This is, of course, easier said than done and every trip out, including this one, I end up with a lot of the shots I just mentioned. But sometimes you get one like this.